LANGKAWI, 4 June 2012 – The National University of Malaysia (UKM) is to undertake scientific studies and research at the Underwater World Langkawi Sdn Bhd (UWL) theme park here. A Memorandum of Understanding (MoU) allowing for this was signed by UKM Vice-Chancellor, Prof Tan Sri Dato’ Wira Dr Sharifah Hapsah Syed Hasan Shahabudin and UWL Director, Puan Sri Fadzilah binti Md. Ariff here this morning. 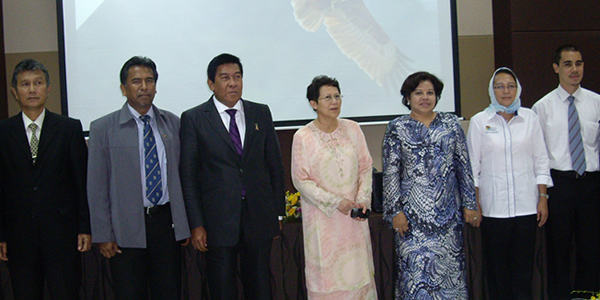 Chief Executive Officer of the Langkawi Development Authority (LADA), Tan Sri Khalid Ramli was also a signatory. UKM’s Institute of Environment and Sustainable Development (Lestari) had organised the event as part of Langkawi’s overall development as a GeoPark, through the Langkawi Research Centre (PPL) which had been actively studying the natural resources of the island since 2003. Underwater World Langkawi is located at Pantai Cenang, a popular beach in the south of the main Langkawi island off the north western coast of Peninsular Malaysia. It is one of the largest marine and fresh water aquaria in South East Asia. Since the start of its operation on 26 August 1995, it has become one of the must visit tourist destinations in Langkawi and has attracted a large number of foreign as well as local tourists. Puan Sri Fadzillah said it had attracted over 10 million visitors who came to see some 400 species of marine life since its founding. She said the park has just recently acquired two pairs of RockHopper and African penguins and welcomes researchers and scientists from UKM to study them. The concept and theme of Underwater World Langkawi are geared towards knowledge, education and entertainment. It wants to raise awareness of the importance of conserving the country’s precious aquatic life forms, thereby promoting understanding of the deep and inseparable bond between man and nature, Puan Sri Fadzillah said. Unique to Underwater World Langkawi is its gigantic 15-meter long walk-through tunnel consisting of 500,000 liters of seawater which houses many big fishes and sea creatures. Langkawi has been designated as a GeoPark defined by UNESCO as a geographical area where geographical heritage sites are part of the holistic concept of protection and sustainable development. The GeoPark takes into account the whole geographic setting of the region and sites of geological significance would not be included for development. LESTARI’s Langkawi Research Centre (PPL) promotes integrative research that is holistic engaging researchers of diverse backgrounds. It is based on four major programmes: Geology and Landscape Resources; Biology and Marine Resources; Cultural and Local Tradition Resources and Environmental Health. Other than research conducted by these four core groups, PPL has also conducted collaborative research activities through funds awarded by several agencies both local and international, such as LADA, Department of Mineral and Geosciences (JMG), Department of Forestry (JPSM), Underwater World Langkawi, Global Geopark Network (GGN), Coordinating Committee for Geosciences Programme in East and Southeast Asia (CCOP), and UNESCO. Findings and outputs from these collaborative research activities have assisted PPL and LESTARI to coordinate as well as take part in several events such as PPL Scientific Expedition. As a research centre, PPL also functions as a station for postgraduate research and education. Five students are currently pursuing research for their PhDs while two others at the Master’s Degree level. Their research will provide important inputs and information in achieving PPL’s objectives including the need to increase the potential of ecotourism industry in Langkawi with greater consideration on preserving the natural resources heritage. Journals and books were also published by researchers in PPL, while several new and on-going research projects are still being conducted. LADA was set up in 1990 by the federal government to oversee all developments on the island. Its objective is to develop Langkawi into a prime tourism destination aimed at improving the socio-economic well being of the local population. LADA and the Government had supported the idea of setting aside tracts of land and marine ecosystems on Langkawi for preservation so as to be part the natural heritage of the island.